August 21, 2013: Obama’s insidious and criminal objective in August 2013 was to use these attacks with a view to justifying a humanitarian war against Syria. In the wake of the Syrian chemical weapons attack, shocking footage of the victims of that attack were widely circulated in an effort to raise the ire of the public and spur support for military intervention. Now, a new report on that footage finds troubling inconsistencies and manipulation with the video that calls the official narrative of the attack and its victims into question. This is the GRTV Backgrounder on Global Research TV. Earlier this week, UN Secretary General Ban Ki-Moon submitted the findings of the UN chemical weapons inspection team dispatched to Syria last month to gather evidence on the August 21st chemical weapons attack in Ghouta. The determination of where the attacks originated from is of course the key issue geopolitically speaking. If the attack originated with the Syrian government it would mark a serious escalation in the conflict, but if the weapons were launched by the terrorist insurgency it would mean the attack was a false flag provocation, designed to draw the US and its allies into armed military intervention in the country. As analysts have been at pains to point out, the motive for such an attack has always suggested that it was more likely that the terrorists were the culprits in Ghouta, not the Syrian government. They have been losing the ground war against Syrian government forces for months, and they knew that the use of chemical weapons was the “red line” that Obama had set as the threshold for military intervention. Those who argue Assad’s culpability have to believe that not only did he suddenly and inexplicably resort to using chemical weapons on his own people for no strategic military reason, but that he waited until UN chemical weapons inspectors arrived in the country before doing so. The background and history of the conflict also provide ample evidence that the terrorists have chemical weapons in their possession, and are trained and motivated to use them. Last December it was reported that US forces were training the terrorist forces in the the handling of chemical weapons. Also last December the insurgents released a video showing their chemical weapons operations and threatening to use them against government supporters. And in July of this year, Russia submitted an exhaustive 100-page report to the UN outlining how the terrorist insurgency was in fact to blame for the March 19th chemical weapons attack in Khan al-Asal on the outskirts of Aleppo. But in the light of this latest chemical weapons attack, the UK, the US and France have all released their own intelligence studies blaming Assad for the incident and calling on the “international community” to increase pressure on the Syrian government. The reports, however, contradict each other in numerous places, with wildly different estimates of casualties in the events suggesting that the intelligence agencies that produced the report cannot even agree on the most basic details of the attack. Now, new evidence is emerging that the attacks were used and manipulated by the terrorists in order to provoke the US and its allies into armed intervention in Syria. This evidence suggests that the videos used by the US and its allies to conclude what happened in Ghouta were in fact carefully stage managed to portray a narrative that would pin the blame for the attacks on Assad. The first indications of this plot emerged early on, when expert analysis of the videos suggested inconsistencies in the footage itself. That analysis was later expanded on by a report from ISTEAMS, a Syria-based human rights group working in conjunction with the International Institute for Peace, Justice and Human Rights. In this thorough report, published on GlobalResearch.ca on September 16th, numerous discrepancies and inconsistencies in the footage are documented. The report documents through eyewitness testimony and video evidence that the affected areas had been largely abandoned by local residents in the days prior to the attack. Yet in the footage of the aftermath, there are large numbers of child victims who are portrayed. There exists very little footage of parents with their children, and what little footage exists portrays some of the parents apparently “discovering” their children on multiple occasions in different locations. Other footage shows the same children arranged in different formations in geographically distant neighborhoods. The report concludes that the footage was carefully stage managed to create the greatest emotional impact on foreign audiences. These videos were then used by the Obama administration to convince the Senate of their case for military intervention. 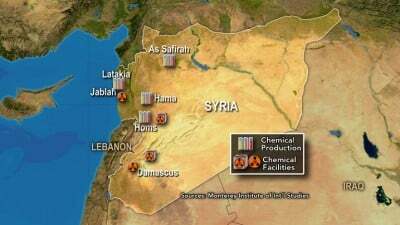 ISTEAMS President and one of the key researchers on the report, Mother Agnes Mariam, joined The Corbett Report to discuss the problems with the official narrative of the chemical weapon attack emanating from Washington and its allies last month. The ISTEAMS report raises many troubling questions about the scenes in the Ghouta videos. Were the victims of the attack local children? If so, why were they there after these areas had been largely abandoned? Where are their parents? In the days after the attack, Dr. Bouthaina Shaaban, an advisor to the Assad government, provided an equally troubling answer to these questions to Sky News. These reports dovetail with videos posted by the Mujahedeen Press Office to YouTube just six days before the attack confirming that the terrorists had kidnapped hundreds of women and children from the rural villages of Alawite stronghold Lattakia to use as bargaining chips in the conflict. Were these kidnap victims moved to Ghouta to be killed in the chemical weapons attack? Is this why so many children were there in these largely-vacated areas, and why so few parents appear on video mourning their children? Although further research and investigation is urgently needed by third-party organizations to establish the identity of the Ghouta attack victims and the whereabouts of the kidnapped Lattakian families, the reports, if true, are evidence of the most disgraceful war crimes imaginable and the most cold-blooded manipulations of evidence to suit an agenda. Earlier this month, Global Research Director Michel Chossudovsky appeared on GRTV to discuss the nature of the terrorist insurgency. Now, the US and its allies are trying to use the UN’s new report in combination with the video “evidence” of the attack’s aftermaths to justify the use of military force to back up the Syrian chemical disarmament process. Some are even calling for Assad to face war crimes prosecution on the back of this and similarly manipulated evidence. In order to prevent this war agenda from proceeding any further or these propaganda images from being used in the pursuit of military intervention, it is vital that this latest ISTEAMS report is downloaded from Global Research, widely disseminated, and thoroughly investigated.